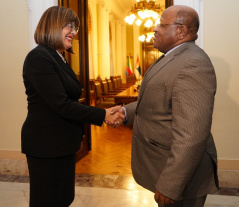 The Speaker of the National Assembly of the Republic of Serbia Maja Gojkovic met today with the Minister of Foreign Affairs and International Cooperation of the Union of Comoros Mohamed El-Amine Souef, and on the occasion emphasized the importance of this, the first official visit in decades, as it opens up new windows of opportunities to strengthen cooperation across the board. The officials said that the friendly relations between the two countries should be improved in view of the cooperation established during the Union of Comoros’ decolonization and fight for independence. Gojkovic said that Serbia is proud of the history of relations dating back to the times of former Yugoslavia and the Non-Aligned Movement, stressing that this historic friendship obliges us to keep advancing relations in all areas of common interest. Gojkovic said Serbia expected the Union of Comoros to take its side in the so-called “Kosovo’s” attempts to join international organizations. The Serbian Assembly Speaker said that Serbia supports the territorial integrity of the Union of Comoros and will continue to support the Comorian positions. The Comorian Foreign Minister said that as a friendly country Serbia can count on the Union’s full support and vote in international organizations. Gojkovic urged for the development of parliamentary cooperation at the highest level, as well as at the level of committees and parliamentary delegations, taking the opportunity to mention that Serbia is the only country to Europe to have a cooperation agreement with the Pan-African Parliament. El-Amine invited the National Assembly Speaker to visit his country and emphasized the importance of cooperation and exchange of experiences relating to the adoption of legislation and representation of women in parliament. Gojkovic and El-Amine highlighted the importance of Serbia’s strengthening relations with African countries, agreeing on the need to develop cooperation in the fields of agriculture, infrastructure and education.